With a little help from the Virginia police in the Fairfax County Sully District, but also “thanks” to the obscure Bilderberg media-relations outlet and its May 19 late-coming online announcement, it’s been confirmed that Bilderberg 2017 will take place in Virginia, June 1-4, at the Westfields Marriot in Chantilly. The Bilderbergers are naturally attracted to that snooty, secluded hotel, since they’ve met there before—in 2002 and 2008, and in 2012, the year that Jim Tucker, the late American Free Press Bilderberg hound, made his last appearance covering the shadowy group after chasing these sons of smokestack billionaires since the mid-1970s. The annual Bilderberg gatherings are perhaps the most exclusive and obscure among all the meetings of economic ministers (G-7 etc. ), the World Economic Forum and other more familiar global groupings. Encircled by an armada of private armed guards and publicly financed police, the Bilderberg Meetings, as they’re formally called, are totally closed to the reporting press and public, with the entire five-star hotel or resort of choice sealed off. Even the Bilderberg “sibling” group, the younger but larger Trilateral Commission, co-founded by the late power broker David Rockefeller, doesn’t resort to sealing off an entire hotel for itself. 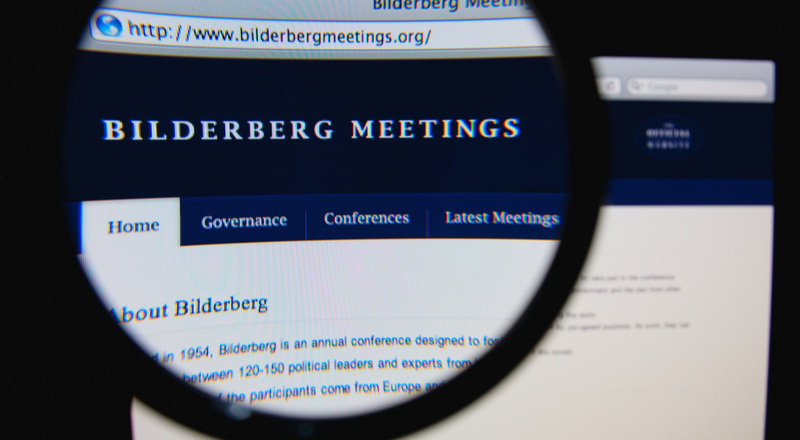 The Bilderberg Meetings are the perfect convergence of public and private interests for the basic purpose of secretly charting the world’s economic and political destiny, although many other groups, including the Trilateral Commission, the Council on Foreign Relations and the Royal Institute for International Affairs (Chatham House), are represented in some manner at Bilderberg and do their part in “the network” as well. The Bilderberg gatherings consist of 140 chiefly European and North American central bankers, finance ministers, former and current legislators, former and current prime ministers, corporate titans, and media moguls and editors who attend but agree not to report on the proceedings, thereby putting the public trust last. Other participants include European royalty, NATO and other military brass, select think-tank fellows from the Brookings Institution and other noted institutes, and high-tech gurus from Silicon Valley, among others. Britain also voted just after last year’s Bilderberg meeting to exit the European Union. Early Bilderbergers, beginning with their first meeting in Holland in 1954, helped build the EU through all its intermediate stages to the present. This TRUTHHOUND BLOG editor, having covered six previous Bilderberg gatherings, will travel to Chantilly to further discern the status and agenda of Bilderberg. Bilderberg functions as a world-networking and planning forum for the purpose of off-the-grid private governance for the banking and general corporate classes, whose officers and other representatives are sealed in the same hotel as key government officials. Those officials are in a unique, carefully concealed position to cut special wide-ranging deals for select corporations, even while the Bilderbergers groom select attendees for future important positions in government and the private sector.